Choose from time-based recovery or complete recovery options to restore your Oracle database. The Oracle server Restore feature allows you to restore your Oracle server databases from your IDrive account. Authentication of Oracle server database for restore. Provision to restore the Oracle database using Complete and Incomplete recovery methods. Provision to report the progress of the restore process. Enhanced security as data is transferred and stored using 256-bit AES encryption with a user-defined key that is not stored anywhere on the IDrive servers. Provision to generate the log files for each restore session. Consult your Oracle DBA before you perform the Oracle server restore operation. Locate and select the ‘IDOracleBackup' folder in your IDrive account. 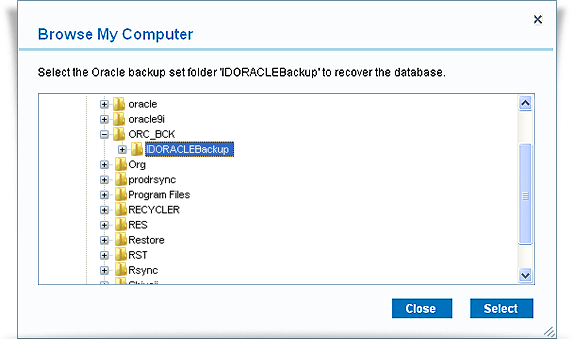 Click 'Restore Now', to restore the ‘IDOracleBackup' folder to the local computer. Note: The 'IDORACLEBackup' folder selected for restore should be in the same path as it was while performing the backup operation. Under Oracle Server section, click 'Restore'. Provide the relevant Oracle Server authentication information when prompted. 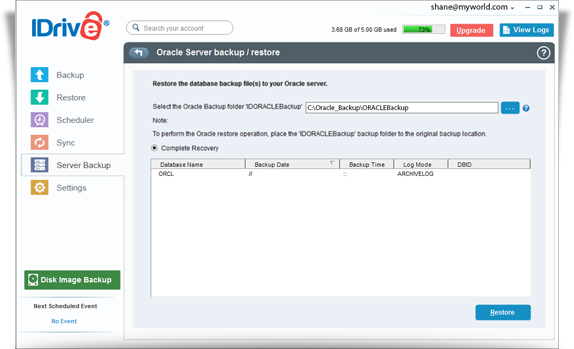 The ‘Oracle Server backup/restore’ screen is displayed. Browse and choose the 'IDOracleBackup' folder (restored earlier from your IDrive account). View the steps to backup Oracle server.